Today I’m sharing photos of my apricot raspberry tart along with a few tales of my tart baking adventures. 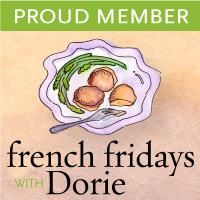 I’m circling back with the Tuesdays with Dorie online baking group this week to join in with their assignment to bake a simple fruit tart from Baking Chez Moi. Apricot season is a short one, some would even say short and sweet. I actually have an apricot tree in my back yard and I like to say that whatever the birds don’t eat is free for the picking. Here in Northern California, this is actually the best time of year to make pies or tarts with apricots, raspberries and blackberries because this fruit is all so good right now. I made a few changes to the original recipe which is something I like to do and our sweet cookbook author, Dorie Greenspan encourages us to do. For everyone who is baking along with us please note the Bonne Idée sections throughout the book. The more recipes you try, the more you’ll want to change up the originals and try out your own creativity. I used Dorie’s sweet tart dough recipe from Baking Chez Moi for the tart because I think it’s simple to make and so much better than anything in the grocery store. In France this type of dough is called pâte sablée; it’s easy to find in stores and the quality is excellent. On to a few notes on my method for making tart dough: I use Dorie’s recipe as written but stir a few drops of cold water into the egg before I add it to the flour mixture in the food processor. When the pastry dough is ready I roll it out between two sheets of parchment paper. I pull off one sheet of paper, flip the pastry into my tart pan, pull off the other sheet, gently press it into the pan and trim. I wrap the whole thing up and chill before pricking the bottom and finally chilling in the freezer for about 20 minutes before I bake it off. I like my method because I don’t have to wrestle the chilled rolled out pastry dough into my tart pan, it’s already in the tart pan and ready to go at the same time it’s completely chilled and ready for the oven. If you have any questions, send me an email. I love my no fuss method and can’t believe how easy I’ve got it in the tart dough department. As for the actual tart filling I substituted ground pistachios and granulated sugar (about 1/3 cup) for the cake crumbs or homemade ladyfingers. This was also very simple and worked perfectly to keep the tart crust from becoming soggy. I also used some of my homemade apple jelly stash to add both sweetness and as a glaze over my fruit. I added a few blackberries for color and loaded up on the pistachio nuts, oh so good. I baked the tart for the full hour with all the fruit, just saying because sometimes I have a hard time reading and following a recipe, even when it’s only a few paragraphs long… but, my tart turned out fine and was enjoyed by all. Please check out the other Tuesdays with Dorie fruit tarts here and if you haven’t already, pick up your copy of Baking Chez Moi, which includes this tart recipe and many more. Wow! Great photos! I like the addition of blackberries and apple jelly! Great idea! What an exquisite summer tart, those colors are gorgeous! So gorgeous! I’ll have to give your tart shell technique a try! Thanks for the tart tips! I’m going to give that a try! Your tart looks delicious. Oh to have fresh apricots from your backyard! That is divine! Your tart looks wonderful Patty – the changes worked a treat. What a stunning fruit tart, Patty! I love the wonderful colour contrast. Your tart is beautiful and full of color and good healthy ingredients. It’s funny I always eat dried apricots, never fresh. Now I’m tempted to make this and pick up some fresh apricots to eat on their own. I had to laugh, I have a difficult time following recipes too! Lush with all flavors of summer, your tart is a stunner! I don’t think there is a word that can describe how beautiful this is!! Stunning. Just stunning, Patty! Your tart is simply beautiful! Wow! So pretty! Love what you did with this! What a gorgeous looking tart! Love all the tweaks you’ve made! Looks delicious! Your tart looks amazing! I love that you made modifications! (I added water to my tart crust too). Your tart is just beautiful. Substituting the cake crumbs with ground pistachios was a great idea. Greetings Patty !!! So fun to see your stunning tart and I loved all that you shared on this post. I am with you about how fabulous Dorie’s pastry recipe is- what a winner. Love your steps for getting the dough in the pan easily, thanks for sharing. Absolutely stunning tart, Patty! Love the changes you made…the pistachios on the bottom of the fruit sound luscious! And I so agree that Dorie’s sweet tart pastry is the best…it’s my “go to”! As always gorgeous photos and presentation! Nice baking with you this month!! Hi Susan, sorry to hear that! But, thanks I did receive your comment! I enjoyed your post, Patty, and actually printed out your fifth paragraph and taped it into Dorie’s Baking cookbook. Probably will make another copy for Chez Moi. I haven’t had the luck with Dorie’s pastry dough that others have had – think I needed the extra moisture – but I also will be more comofotable to get that baby rolled out before putting it in the fridge. Call me crazy, but I never would have done that. I like your various tips and ideas on how to change, improve, or do a recipe differently. the addition of the blackberries, all the fruits work well together. Your apricot tart looks beautiful and delicious. I envy you have an apricot tree all to yourself:) We enjoyed this one too. Your recent posts look like you have been enjoying seasonal fruit. Happy summer. that’s a stunner for sure! and all the fruit is so exactingly placed. This is one I really want to make before the apricots and raspberries disappear. I’m making ladyfingers tonight or tomorrow, so perhaps I’ll get on this tart, too.